Looking straight up into the sky, a casual observer would have called it a perfectly beautiful Autumn day. The view at ground level, though... was far from delightful. A patch of savannah in a valley no wider than a small city block had been fought over by Rallo & Foran warriors for over eight months. The line of skirmish would move 50 paces in one direction one day, then nearly the exact distance in reverse the next. The prisoner situations on both sides was beyond critical. A construction supervisor working on the newest Rallo prison, a stone's throw from the battlefield, was surveying the work in progress, verifying dimensions of the skeletal structure in preparation for the walls of the second floor to be erected. As he gazed through his optical measuring device, he realized he was looking directly towards the battlefield, and in a moment of curiosity he recalibrated the device's focus to have a look at goings-on over on the Foran side. He noticed the makings of a brand new structure not far off in the distance, and started looking for clues in its design that would indicate its purpose. As he scanned slowly from side to side, investigating the foundation & frames, he noticed a Foran worker carrying an expensive toolcase up a ladder, and he decided to follow this fellow for a bit. The Foran carefully made it up to the second floor, which appeared to be nearly ready for its walls to be raised. He opened his toolcase, and what emerged but an optical measuring device and a tripod; what a coincidence. More curious than ever, the Rallo surveyer adjusted his focus ever slightly better to get a perfect view. The Foran got fully set up and began taking measurements until, facing towards the battlefield, something caught his eye in the background; a new building in the making. The Rallo's breathing became heavy and panicked. He had realized something but did not want to believe it. He pulled away from his scope for a moment to look across the way with his naked eyes, then turned his attention back to the device. The Foran did the same. Completely shocked, they each looked over the other's site again, now immediately recognizing eerie similarities, then returning stunned gazes towards each other. They were both construction supervisors, and they were each building prisons to house captives from the other's military forces; forces that were fighting just between them. The account of this astonishing encounter spread quickly among the Rallo & Foran civilian populations, but when it got to their armies, the result was profound. Opposing warriors met at the line of skirmish in that small valley and before engaging in battle, began to speak of the recent incident and pause to ponder its significance. The clashing of weapons and shields that had gone on continuously for the better part of a year, stopped completely in a matter of minutes, replaced by pensive murmurs. Workers at the prison sites noticed the change in the air, and they, too, ceased their activities and started slowly walking down towards the battlefield with puzzled looks on their faces. 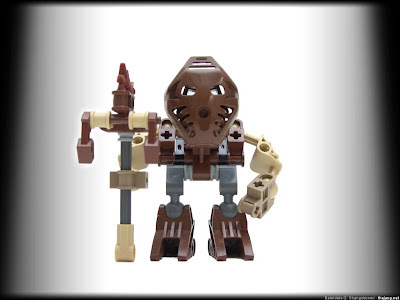 It was the beginning of the end, for a world-wide Bionicle war of which there could never have been any winners. "I always told them they should stop [fighting]. Now, see? This is much better." Such a simplistic view on it all. Such... profound wisdom. At last, with this new peace, the citizens of Rilovia saw fit to follow the guidance & leadership of the elders again.